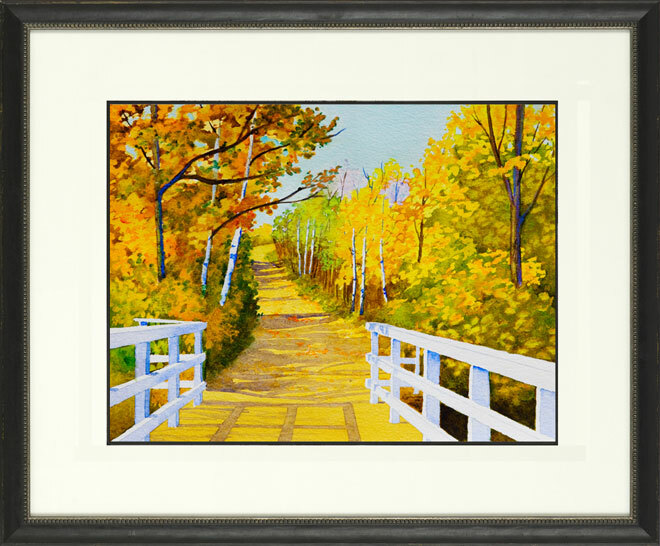 Watercolor paintings are usually matted and placed in a frame with protective glass. Special glass may be used to keep ultraviolet light from fading the art or reflecting the light. Mats are used to frame the art and to keep it from touching the glass. The mats may have one or more layers in various colors, and they may be cut to just about any shape or size. Frames are usually wood or metal. They should complement the colors in the painting, not overpower it. A professional framer is generally knowledgeable and helpful when selecting a frame, quality glass, and matting that preserves the painting for posterity. Framing can be expensive, so it is good to examine the framer's work before committing to an art framing project. Chestnut Hill Gallery is located in a quaint, tree-lined shopping district. The gallery showcases art by renowned, well-established artists as well as new emerging artists. The gallery houses a full-service custom framing center.